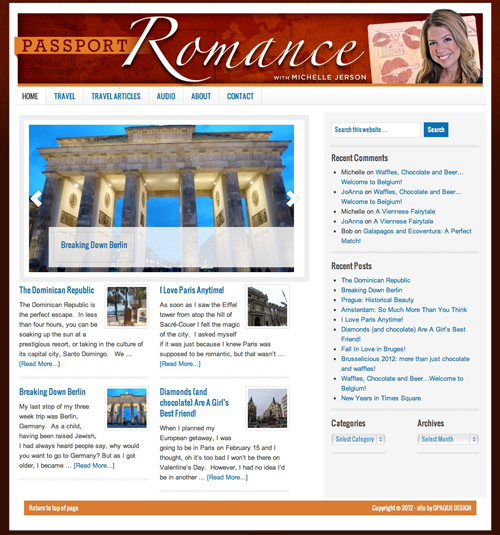 Web site design for Passport Romance. Passport Romance is a travel and lifestyle site run by radio and television personality Michelle Jerson. The site is built on a WordPress framework for content management, which allows her to easily add posts and photos to her site. Michelle had an existing WordPress blog that was on her main website with many years of existing content. She wanted a new design that was more organized and flexible, as well as move the blog to it’s own domain. We designed a new site and imported the database from the old site to the new framework.